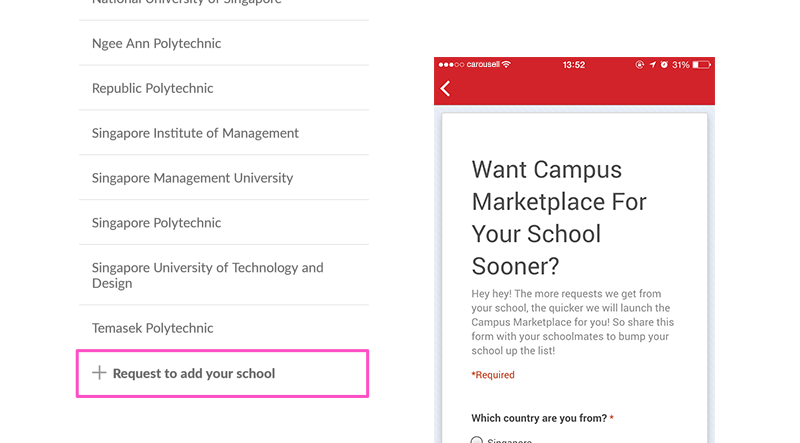 Campus Marketplaces are currently available for Singapore, Malaysia, Indonesia, Taiwan and USA, so only schools from these countries will appear on the app. If you don't see your school on the list, scroll to the bottom of the page and tap "Request to add your school". You'll come a form that you can fill up to let us know that you want your school to have a Campus Marketplace. The more people from your school that send in requests for a Campus Marketplace, the faster we'll get it up and running! So be sure to let your schoolmates know so you can start buying and selling on campus as soon as possible.